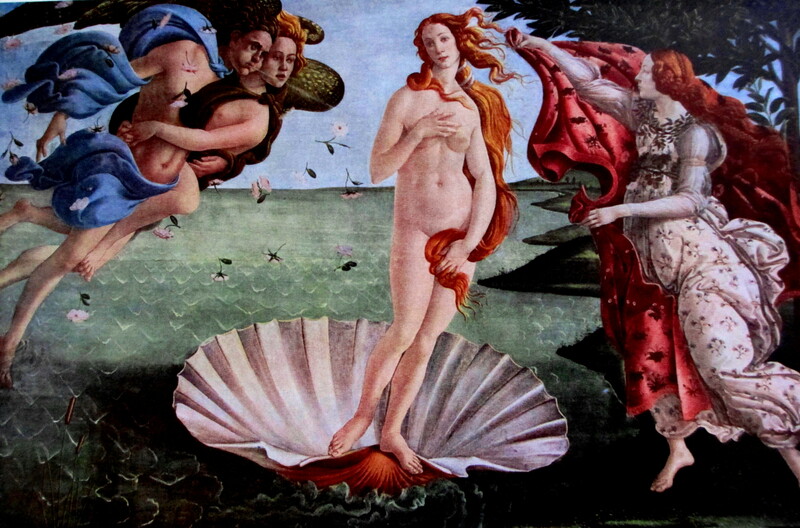 This year’s Chelsea Flower Show in West London has a large clam shell where a model has been posing in it, representing Botticelli’s masterpiece “The Birth of Venus” aka “Nascita di Venere”. ‘Botticelli‘ was a nickname which he was given and originated from the insignia on the overhanging shop sign of his father’s tannery business. The insignia was a “little barrel” aka “Botticelli“. Born c.1445 in Florence’s Via Nuova, Borg’Ognissanti; Alessandro di Mariano, (Botticelli) was also known as signing his pictures as ‘Sandro di Marino’. He is considered one of the most famous Italian painters of the Early Renaissance School and of “The Golden Age” of art. He began his studies firstly under the patronage of Lorenzo de’ Medici, and then became apprenticed at the age of fourteen to Fra Filippo Lippi. By 1470, Botticelli had his own workshop. The Birth of Venus (c. 1485) commissioned by someone else for a different site, and is currently located in the Uffizi Gallery in Florence. Botticelli never wed and was not keen on marriage, which he described as “a prospect that gave him nightmares”. According to Wikipedia, one view is that he suffered from an unrequited love for Simonetta Vespucci, a married noblewoman, who was his model for “The Birth of Venus” and recurs throughout some of his paintings, despite the fact that she had died almost 10 years earlier, in 1476. Needless to say, it has been acknowledged that Botticelli requested upon his death that he be buried at her feet in the Church of Ognissanti in Florence, which occurred on his death on May 17, 1510. This entry was posted in Gallery Art, OilPainting, Paintings and tagged Art, Birth of Venus, Botticelli, Early Renaissance School, Nascita di Venere. Uffizi Gallery, Sandro Botticelli. Bookmark the permalink.